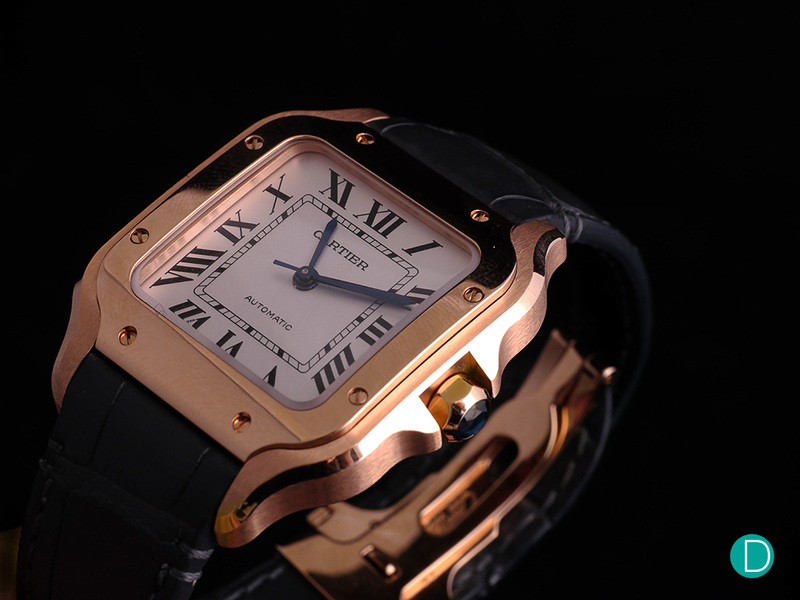 One of the most iconic watches by Cartier, the Santos needs no introduction. The origins of the Santos dates back to 1904 when Cartier first designed the watch to accompany aviator Santos Dumont on his intrepid flights. Funny as it seems, the Santos then bears the pedigree of a Pilot’s watch and is one of the earliest tool purpose wristwatches in history. The new 2018 Cartier Santos Large size with date. At the end of the 1970s, the Santos was relaunched as a bracelet luxury sports timepiece, iconic for its large number of screws used on both the bezel and the bracelet. The watch saw regular updates and was in production until 2016, when it was discontinued. This year at SIHH 2018, the Santos was once again relaunched by Cartier. It takes on an updated case design and bears a noticeably reduced case profile. 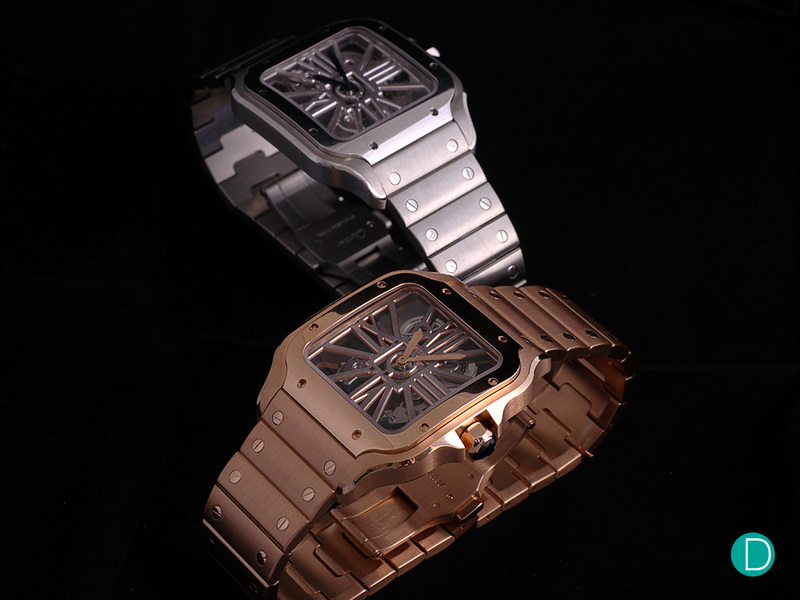 The Santos is available in steel, yellow and rose gold and two-tone steel gold. The collection is stocked with a smaller no date automatic, a large size with date model and a skeleton dial model. 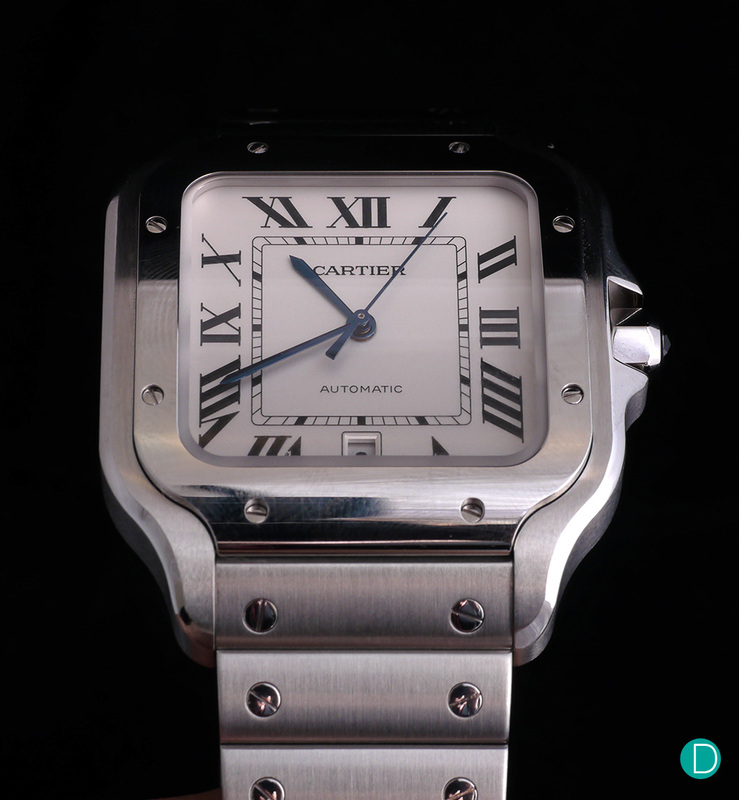 In this review, we will examine the 2018 Cartier Santos Large size with date – which is likely to be the model of choice of the three options. The watch is also available in 18k yellow gold and rose gold. The overall case design remains close to the original with a squared case shape, polished bezel with eight screws and the same straight links steel bracelet with two screws per link. A white dial with Roman numerals is also used in the same layout as before. One difference is with the hands, which now opts for a blued steel sword design instead of the previous lume filled hands. 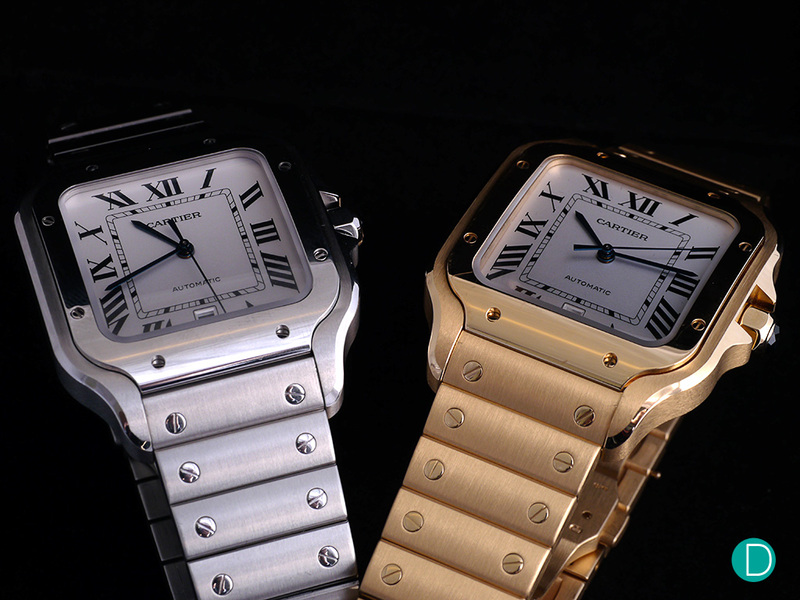 The two Cartier Santos Large size with date models in steel and yellow gold. The best part of the update is a slimmer case profile, and a more demure case, attributed to the round edges and the sloping bezel. The large Santos measures 39.8mm x 47.5mm in width and height and 9.08mm thick. The slim profile is a welcome change to the thick XL case of the previous Santos. A new bezel design also links to the lugs and the bracelet, for a more continuous controlled look rather than the strict square lines in the previous edition. Side polished chamfers and bevelled edges around the case adds to the luxurious feel of the case. The mid-sized model comes without date, but with a smaller 35.1mm x 41.9mm case size. While slimmer and slicker than before, the case is still relatively large on the ‘large’ model, but the case back is slightly curved and the lugs are short, providing good comfort. With its slim profile, the modern sized watch will still fit under the cuff while keeping some heft for those who like a heavier watch. That said, for purists or men with smaller wrists, a non-date version which measures 35.1mm x 41.9mm may provide a better alternative. Each watch comes with both a bracelet and a leather strap, which can be easily interchanged via a quick release system. On the dial, just like old versions, bears the same contemporary design with a silvery-white finish and printed black Roman numerals. The font appears thinner than they used to, which corroborates with the overall reduced style of the watch. The new quick release system as seen on the rear of the end link. A push button is depressed to disengage a spring pressure clip that holds the link to the case. The 2018 Cartier Santos is available in bracelet with an interchangeable leather strap. A quick change system is also employed for quick strap/bracelet changes. The quick release strap mechanism is integrated into the bracelet and leather strap, and is similar to that found on the Apple watch or Fitbit Ionic. While the user benefits from the easier strap change, it also means they will have a hard time procuring after-market straps that can fit this new lug design. 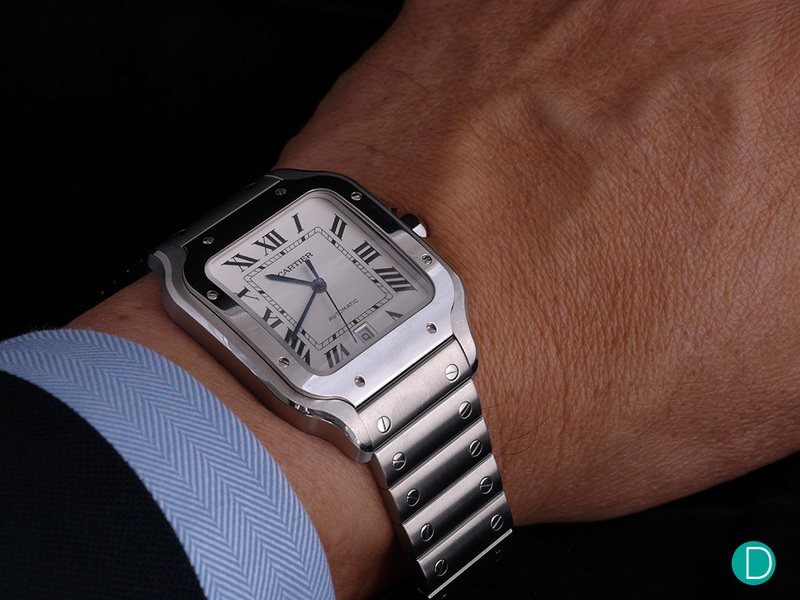 The Cartier Santos is also available in a skeleton dial variation. Apart from the new quick release strap and bracelet, the watch also employs a new bracelet adjustment system. 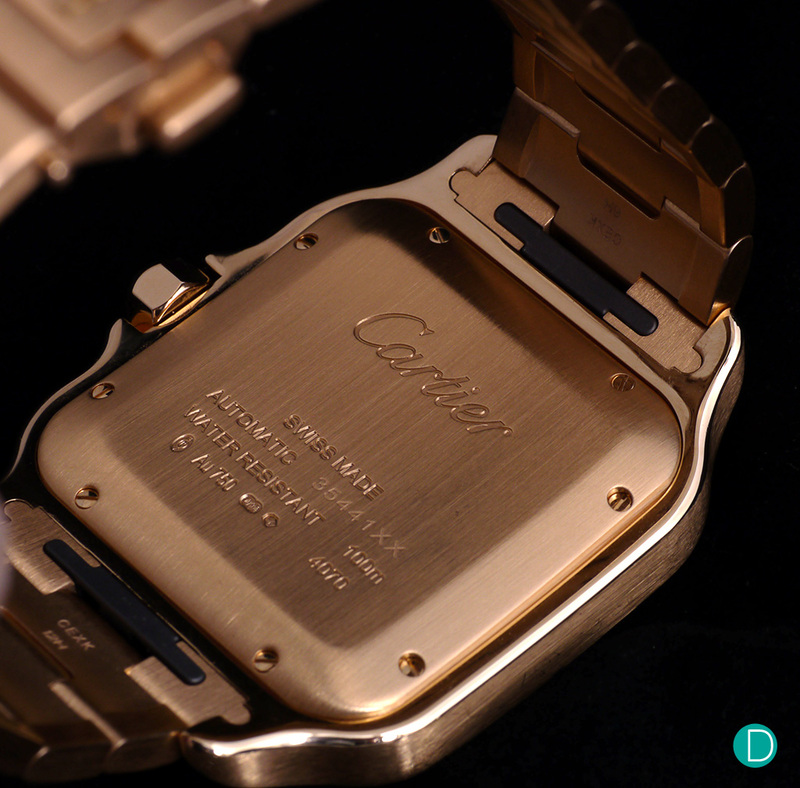 Cartier’s SmartLinks is operated by depressing a small push button on the underside of the links, which spring releases the link bar without the need for a screwdriver or a changing tool. It is similar in concept to the sim card ejection port found on smartphones, albeit with a larger button. The function is simple to use and reduces the pain of strap and bracelet adjustment. That said, we are curious how new owners of the piece will review the enhancements, given the potential downsides of strength or durability issues relative to the old but stronger holding design. 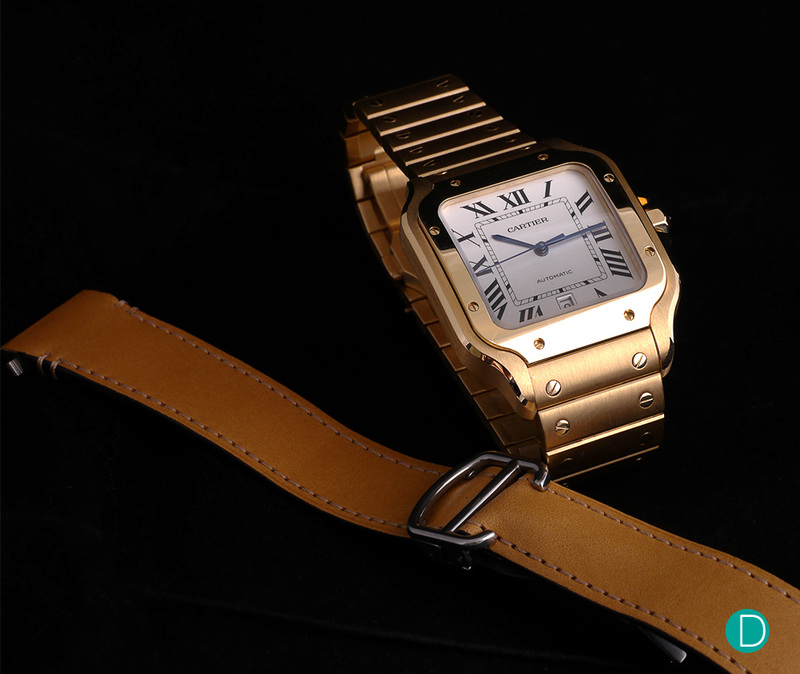 Inside the Cartier Santos is the calibre 1847 MC, an entry-level, in-house produced automatic movement. The watch beats at 4Hz with a modest 42h of power reserve. The watch wears slim and subtle on the wrist, making for a comfortable reduced bracelet wristwatch. 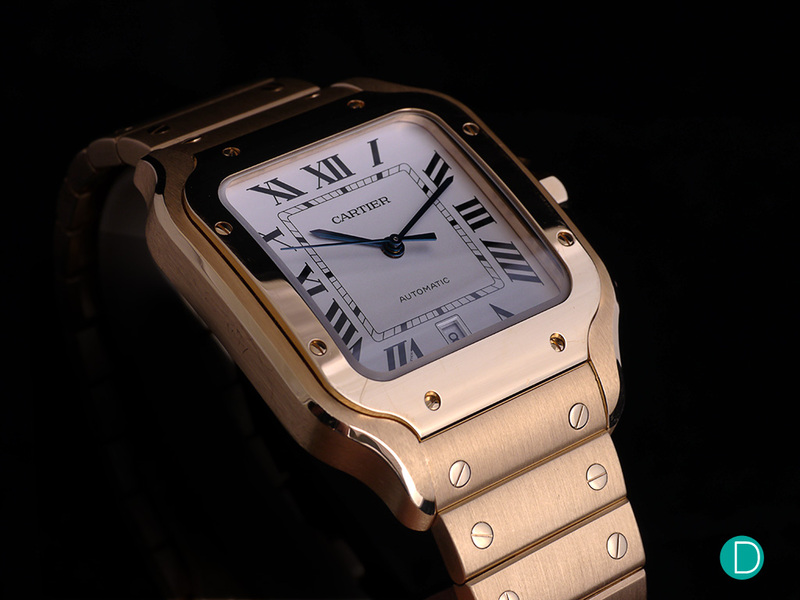 The watch is a very welcome return of the Cartier Santos collection. We especially appreciate the downsizing of the case height and the aesthetic changes to create a sleeker visual appeal to the timepiece. At its price range of Eur 6,600 for the large version in steel, its main competition will be with the Rolex Datejust, Jaeger-leCoultre Reverso and perhaps a Zenith Defy. But for those specifically looking for a square cased timepiece, it is quite tough to find a match to the iconic Santos.